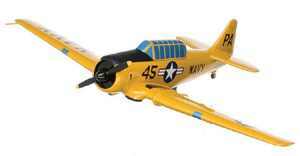 YellowAirplane.com: SNJ-3 / AT6 Texan Trainer World War 2 Model Airplanes, Die Cast and Model Kits. SNJ-3 / AT6 Texan Trainer World War 2 Model Airplanes, Die Cast and Model Kits. Plastic Model Kits & Die Cast Model Airplanes. SNJ-3 / AT6 Texan section. of the World War 2 Fighter Airplane Model Kits Department. AT6 Texan / SNJ3 Texan. SNJ-3 / AT6 Texan Model Airplanes. Pre Built Mahogany Model Airplane. Plastic model kit of the famed Texan allows you to assemble the plane so many have flown. Features 7" wingspan and authentic Navy markings. Made of Philippine mahogany, this 1/32 scale model measures 10¾" in length and has a wingspan of 15¾". Hand painted and detailed with USAAF markings, model comes ready to display on the included mahogany base. The RAF version of the T-6 was called the Harvard, and this kit of it has a large 35" wingspan. Suitable for display or rubber-powered flight; assembly required. At Pensacola's Correy Field, in 1942, an SNJ-3 cadet pilot finds home base and his anxious instructor at the end of a stormy day. Limited edition of 500, S/N by artist. 28"x 22" print. A classic portrait of the AT-6 "Texan" WWII advanced trainer. 11"x 17". Two beautifully restored and maintained North American AT-6/SNJs have replaced the more earthy mounts of the original Butch and Sundance, but the maverick, free spirit remains! Print measures 20"x 15" with included matte. This detailed, black and white charcoal pencil lithograph shows another student learning the maneuvers. This highly collectible print is 20"x 16" including border with title. AT6 Texan SNJ The World Models ">Click Here for more aviation art.